This morning’s ECJ judgement that the UK’s legal challenge against a proposed Financial Transaction Tax (FTT) is premature was what many had expected. The UK had challenged the decision to authorise the use of so-called ‘enhanced cooperation’ (where a smaller group of EU members can move ahead with legislation even if it does not have broader EU support) for the FTT. For the UK Government, today’s result is not what it had hoped for (an annulment of the decision to authorise enhanced cooperation), but neither is it the worst outcome. Today’s ruling effectively said that the court could not rule on the UK’s substantive objections to the FTT since the final shape of the tax is unknown and subject to further negotiation between those taking part. This does not prejudice the UK’s ability to mount a second challenge once the final FTT has been agreed and its implications are clearer. However, while the UK will get a second stab at challenging the FTT, today’s ruling poses major questions about how ‘enhanced cooperation’ works and how it is used in the future. The EU Treaties stipulate that authorisation of enhanced cooperation (which is given by a qualified majority vote of all EU member states) is conditional on the proposed legislation respecting the integrity of the single market and not impacting on those not taking part – this is meant to be a legally enforceable safeguard for those countries not participating. Enhanced cooperation is a relatively new phenomenon that has only been used twice before (for a European Patent Office and divorce law), but it could have huge implications for the future of the EU and Britain’s place within it. In an increasingly multi-tier EU, enhanced cooperation may be used more often by countries that want to integrate further. For those that don’t wish to follow suit, it is vital that their rights in the single market are respected. Let us start with an analogy. Imagine you had agreed to let your neighbour build a new house based on a certain agreement and set of plans. Halfway through building it becomes clear that he has adopted a new plan which will hamper your view or infringe on your land. You appeal to the council but they rule that it is too soon to tell where the house will end up and that they can only rule when the house is built. Tearing down a house is much messier and more costly than stopping one being built in the first place. Hardly seems efficient or fair, does it? Yet, in this case, this seems to be what the ECJ has done. It has effectively decided that it could not decide whether the decision to authorise the FTT proposal does respect the rights of those not taking part because the final outcome of the FTT negotiations cannot be known now. This is strange because this is by definition true in pretty much all cases of enhanced cooperation, since the countries involved negotiate the finer points of the legislation amongst themselves after getting approval to go ahead. While this may seem legalistic and technical it raises a fundamental question: are the authorisation criteria for enhanced cooperation worth anything? Surely, any decision on the use of enhanced cooperation should be made on the basis of the proposal that is on the table, irrespective of whether it might change (for the better or worse) by the time it is finally agreed as a legal act, which could still be challenged in any case. The potential spill-overs should be examined before those member states not involved give those involved the go ahead. Otherwise they are ultimately authorising an unknown piece of legislation, which once it has built up a political head of steam could be much harder to challenge later on. By its very nature, enhanced cooperation will be used for controversial proposals but today’s ECJ judgement has increased uncertainty surrounding this procedure (it was already uncertain) and undermines the logic of the process for authorising its use. We cannot know what the long term implications of this will be for the EU and the UK but they could be important. As for the FTT, the UK will have another chance to challenge the final legislation (which may end up being watered down anyway due to concerns from those taking part) but by the time it gets to that point, there will be so much political capital invested in it, it may make it harder for the court to strike it down, even if the UK has good legal grounds. Would it not be easier if 'Brussels' simply dissolved the people and elected another? In less than a month's time voters across the EU (that is those who decide to vote) will head to the polls to elect the new European Parliament. 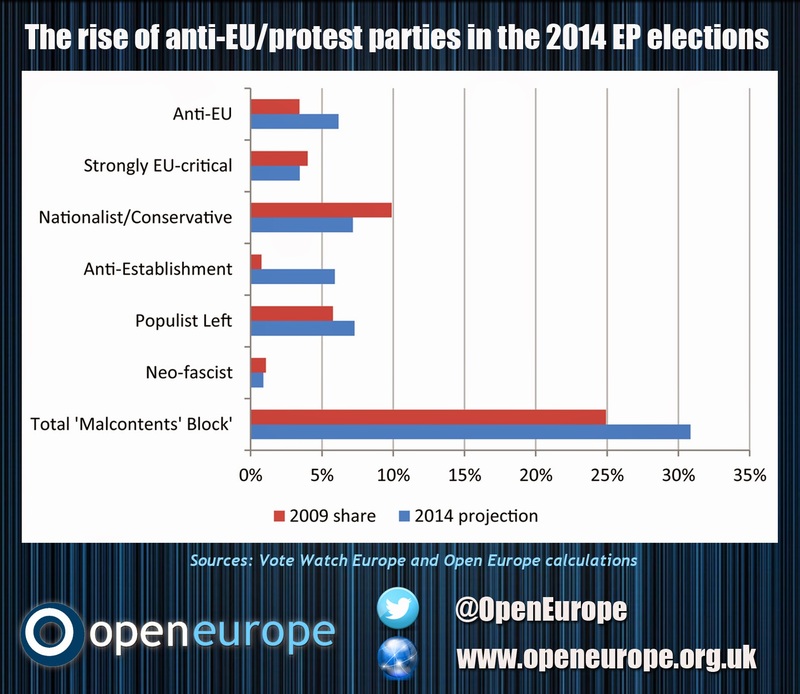 Ahead of the elections there has been a lot of speculation about the surge in support for a range of populist anti-EU, anti-austerity, anti-immigrant and anti-establishment parties and what this will mean. Breaking the parties down into these sub-groups illustrates that the potential 'anti-EU vote' is a complicated phenomenon. In a new briefing published today, we estimate these parties could win as much as 30.9% of the vote in May, up from 24.9% in 2009. This will give them 218 out of 751 seats (29%), up from 164 out of 766 (21.4%) in the current parliament. (You can see our criteria for categorising the parties in the briefing). These parties, loosely termed by Open Europe as the ‘Malcontents Block’, span the political spectrum and differ substantially from each other, ranging from mainstream governing parties to outright neo-fascists, and will not therefore form a coherent block. The largest increases are among the anti-establishment parties typified by Beppe Grillo's Five Star Movement in Italy and the anti-EU vote is largely driven by the rise of the Front National in France and UKIP in the UK. Having said this, we acknowledge that the European elections are in part used by anti-establishment parties to drive a domestic agenda, sometimes with limited links to "Europe". Still from free movement to the bailouts, European issues are now trickling through to voters' decisions. However, despite the strong performance of these anti-EU parties, the EP will continue to be dominated by parties which favour the status quo or further integration. 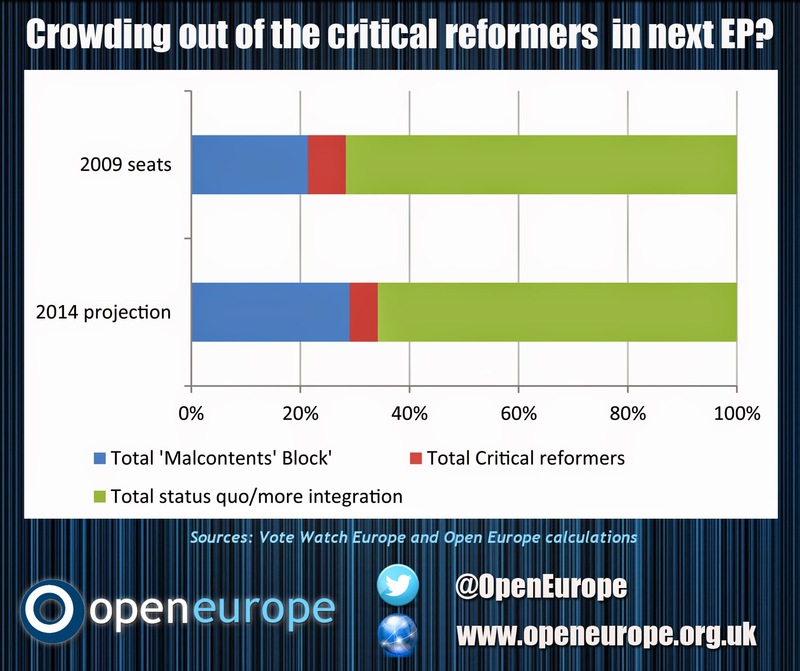 The vote share of parties identified by Open Europe as being ‘critical reformers’ – parties which believe the EU needs fundamental reform if it is to survive – is set to go from 53 to 39 seats. The net effect of the anti-EU vote could therefore ironically be to make the EP more integrationist: by crowding out critical reformers, by reinforcing the corporatist tendency of the two main groups who will want to freeze out the anti-EU MEPs, and by binding the EP and Commission closer together. Another one to watch out for is voter turnout. 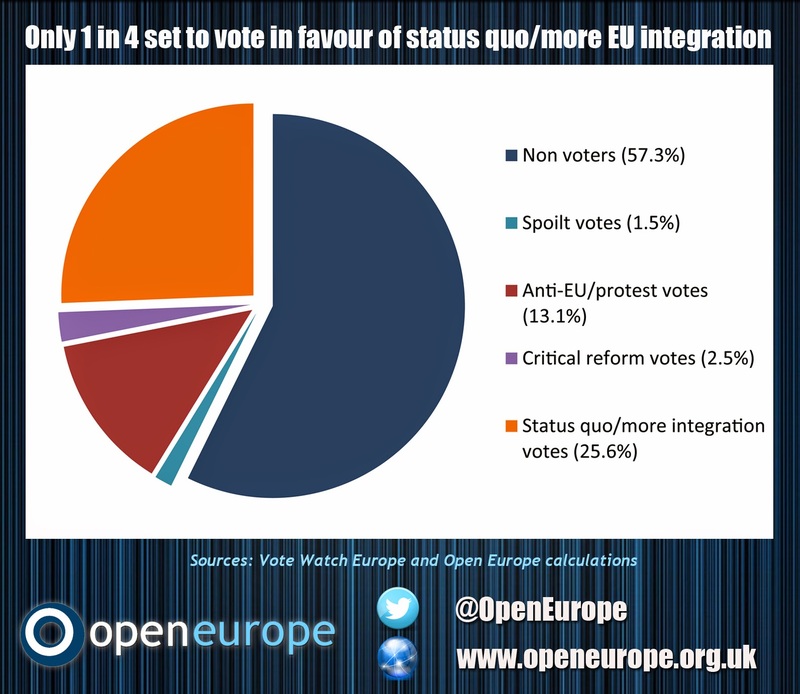 If turnout is roughly the same this time around (43%), we estimate that 74.4% of all voters will have voted against the EU, for radical change, or not bothered to vote at all, with only 25.6% of all eligible voters actively turning out to vote in favour of status quo/more integration parties. This is not to say that all 'non-voters' are anti-EU or anti-status quo - some have tried to put words in our mouth to that effect (somewhat predictably). However, it clearly reinforces the European Parliament's remoteness from voters and the thin democratic mandate that MEPs can rely on to push their agenda in the Parliament. Some may be tempted to see voter apathy as a 'net neutral' - we don't know how these voters would vote after all and they're voting for other things apart from Europe anyway. This is a familiar argument that has been used many times in the past as a pretext for pressing ahead with more integration. However, to conclude that voter apathy in fact means 'endorsement' is naive, intellectually dishonest - and outright dangerous as it'll only create even more fertile ground for an even more hostile response in future. 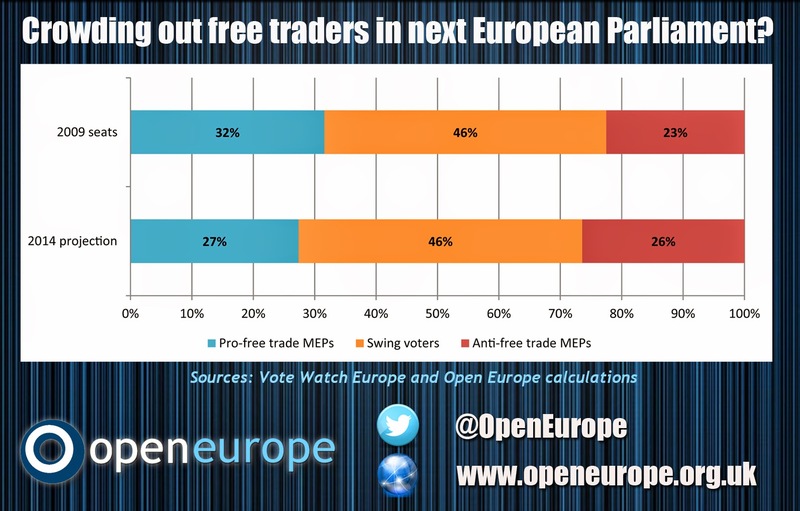 Worryingly for the UK and other liberal minded EU governments, the share of MEPs explicitly dedicated to free market policies is also expected to fall from 242 (31.6%) to 206 (27.4%). All this means that the EP elections may be bad news for David Cameron. 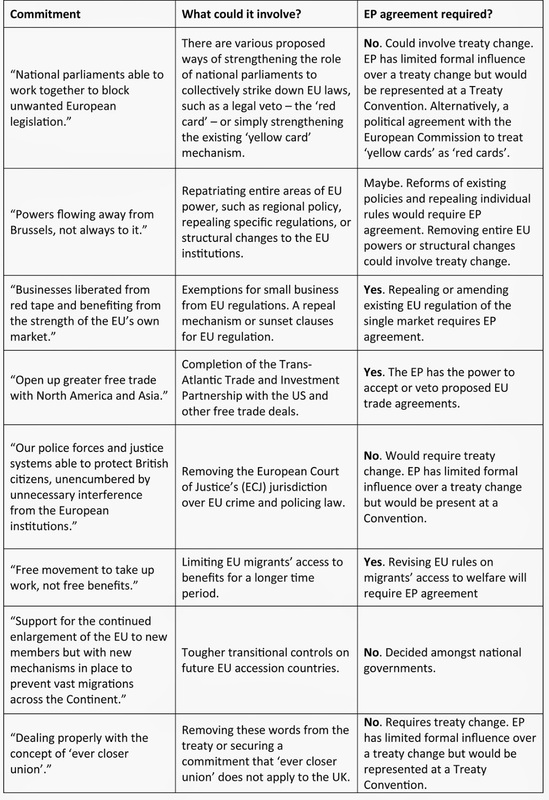 The EP has an effective veto over some of Cameron’s potential flagship reforms (outlined in his recent Sunday Telegraph article), including EU-US free trade talks, services liberalisation and rules on migrants’ access to welfare. The consequence of giving the European Parliament more and more power under successive EU treaties is that these elections matter. MEPs now have equal status with national governments in the vast majority of EU policy areas from regulating working time to bankers' bonuses. Despite this, turnout has fallen in every European election so far and this time around we could see more anti-EU MEPs elected than ever before. The usual response from the Brussels bubble to voter apathy is that people don't 'understand' the EU. Perhaps, this time politicians might spend more time trying to understand why the electorate is looking for alternatives to the likes of Schulz, Juncker and Verhofstadt or not bothering to vote at all. There has been an important development brewing in the UK’s flagship case against the EU's proposed Financial Transaction Tax (FTT). 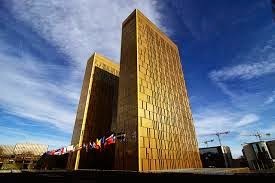 We've known for some time that the European Court of Justice (ECJ) will take a shortened proceeding and rule on the case on the 30 April – this has now become public, as European Voice reported this morning. A ruling hadn't originally been expected until 2015. We expect the ECJ to either throw out the case or rule against the UK - which is problematic for numerous reasons. We have covered the FTT extensively and the court case is an important marker for the UK’s place in the EU. However, it's important not to be too alarmist about this. While the ruling looks unlikely to go in the UK's favour (but it still could) it seems more likely to be dismissed on grounds of the UK's challenge being premature (given that the proposal is yet to be finalised) rather than being outright wrong. So the UK will have another shot at challenging the final decision. Also, the FTT is likely to be substantially watered down so the actual effect might be far less damaging than the Commission proposal pursued under enhanced cooperation. As a key proponent of a watered down FTT, the UK is already to a large extent a winner. Finally, this is a different sub-set to the eurozone (with Ireland and the Netherlands outside). Below is a Q&A on the issue - pardon the length of it. What are the UK’s objections? The FTT is not compatible with Article 327 of EU Treaties which states that any member states not participating under enhanced cooperation must not feel any impact. The FTT will hit UK firms if there are any transactions with those inside the FTT zone. There is no basis in international tax law which justifies imposing taxes on a sovereign state which does not wish to be part of said tax regime. Adopting a law with extraterritorial effects does not fit with the code of international tax law. The tax will be distortionary and impact competition across the EU. Rather than improving the single market it could fragment it. The FTT is not compatible with Article 332 of the EU treaties which states that any expenditure from enhanced cooperation will come from those directly involved. Given that taxes will be raised from UK and other countries not involved, this has been breached. The UK would also likely be directly responsible for collecting and enforcing this tax due to rules on mutual assistance, producing a further burden. 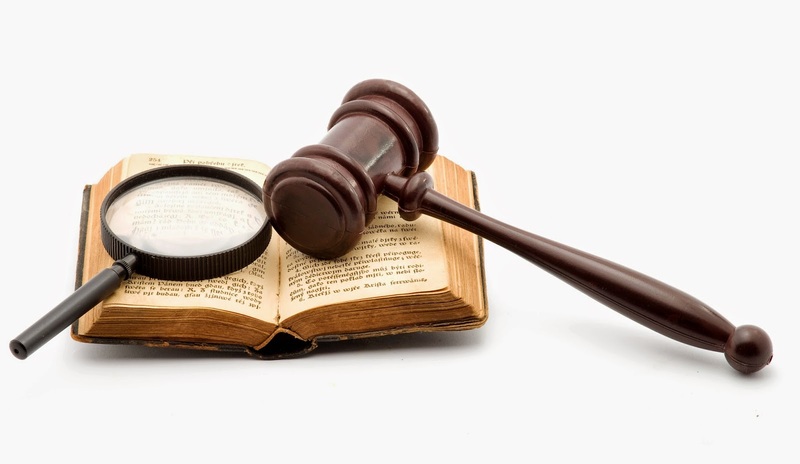 What are the potential outcomes from the ruling? The ECJ rules in favour of the UK – seems very unlikely, but not impossible. In this case the Council would be forced to reconsider the FTT. It would need to adjust the details of the FTT to fit with the ECJ’s ruling and then get renewed support for enhanced cooperation. 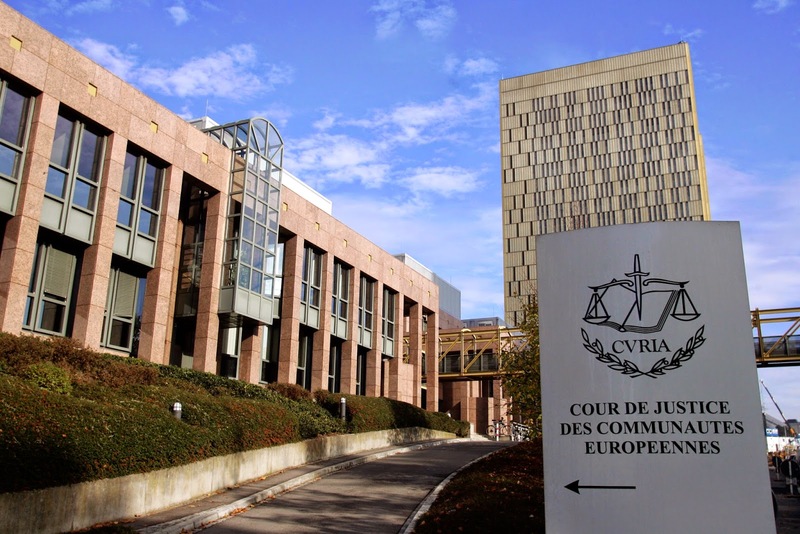 The ECJ rules against the UK and dismisses some or all of its claims – possible. This could amount to the ECJ ruling that the FTT does not have any extraterritorial effects nor that it cuts across the single market. This would not only set a worrying precedent for any future challenge against the specific nature of the FTT itself but also for the UK’s position in the EU more generally, weakening its ability to bloc future eurozone integration with a direct or indirect impact on the UK. Combine this with the growing use of intergovernmental agreements and using the single market legal base for eurozone integration and it's clear the net effect is reduced UK leverage in Europe. 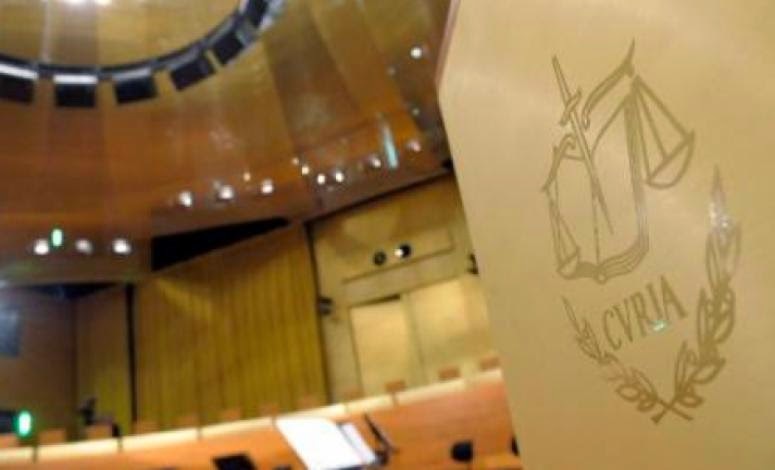 The ECJ deems the challenge premature or unwarranted – likely. Given that the FTT is still a work in progress and the final proposal remains uncertain, the ECJ could throw the complaint out on technical grounds. This would not be too detrimental to the UK, although it would still be a blow as the UK was hoping to stop the FTT as soon as possible. It would also mean that, out of four key legal challenges on financial services at the ECJ (short selling, FTT, bankers bonus cap and ECB location policy) the UK is now at 0/2 - not exactly an encouraging score. Usually, ECJ cases take a minimum of 16 months to work their way through the process of deciding a case. This has taken around 12 months.Written proceedings and arguments were concluded in January this year, normally the case would then move onto a hearing and an Advocate General would present an opinion before the final ruling. The fact that the ECJ has effectively skipped two steps and moved straight to the ruling. This could suggest that the ECJ considers it a straightforward case, which is unlikely to have been the case if the ECJ ruled against the European Commission (always very controversial). Does this mean the UK was wrong to launch its challenge? In the end, we still think it was the right thing for the UK to do. It seems clear to most that there are numerous negative side-effects from the FTT, many of which seem to break rules enshrined in the EU treaties. The broader point is that the UK is right to establish the boundaries of what the EU can do and what enhanced cooperation can be used for. The one caveat in this instance is that, given the large and growing concerns about the FTT, it has floundered and stalled on its own to a large extent, suggesting the legal challenge may not have been necessary. This would especially be true if it ends up going against the UK and setting the precedent described above. If the ECJ rules in favour of the UK, the European Commission will need to table a new proposal. If the challenge is either thrown out or goes against the UK, the Government can still challenge the final legislation (as opposed to the decision to authorise enhanced cooperation). If the ECJ does end up throwing out the challenge for being premature, then the process has taught us little and the final result remains to be seen. It does raise the question though: why was authorisation given for enhanced cooperation before the final make-up of the proposal was known? Portugal this morning followed the lead set by Ireland and Greece and issued new debt for the first time since its bailout in 2011. Portugal managed to sell €750m of 10 year bonds at an average borrowing cost of 3.58% and with demand totalling €2.6bn (3.47 times the desired amount). This is a successful return, albeit not quite as large as Greece’s or Ireland’s issuance. The issue remains small with a decent yield – there will always be demand for this kind of risk and return. This is particularly true in the current market where interest rates are at record lows and there is a dearth of safe assets which still yield a decent profit. The ECB and the eurozone have shown their commitment to keeping the eurozone together and have shown a renewed aversion to private sector write downs on sovereign debt. This combination provides insurance to investors that, even if the Portuguese economy struggles, the rest of the eurozone will ensure that it continues to pay its debts. Of course, all that said, the reforms which Portugal have instituted and which have helped boost exports will play some role in encouraging investors. One specific point to note though is that, on top of the general support given by the ECB mentioned above, it also gave Portugal a more direct helping hand. Die Welt reported on this issue today, terming it a “trick”. In reality, the ECB has altered its collateral rules so that, when Portugal exits its bailout, its government bonds will still be eligible as collateral for its lending operations. The change was snuck through as part of a package of changes in ECB/2014/10 ‘amending guidelines for ECB/2011/10’ last month. The ECB’s line seems to be that this was simply a move to bring all the ratings from different agencies into line for collateral, so they correspond to the correct level in the other agencies. This is a fair point, but the timing seems more than coincidental, especially since these rules have been in place since 2011. The thinking is that, without this change, demand for Portuguese debt would have been limited since it couldn’t be used to gain liquidity from the ECB (we explained here why ratings are still important for just this reason). As such, the ECB looks to have given Portugal a helping hand. We have written before about concerns over the ECB’s independence during the crisis, particularly in relation to adjusting its technical rules to aid struggling countries. This seems pretty close to falling into that category and highlights that, even though the crisis has eased somewhat, the ECB still finds itself treading some difficult boundaries with regards to its independence. All that said, this remains a positive, if small, first step for Portugal. Questions remain about whether it will be able to fully fund itself without a credit line from the EU/IMF and whether export growth will be enough to offset the collapse in domestic demand and investment. There was an interesting poll in today’s FAZ conducted by INSA for Bild on whether Germans believe that eurozone crisis is over or not. The results were pretty comprehensive with 81% saying that they do not believe the crisis is over compared to 7% who do. Furthermore, 34% of Germans believe that Greece is on the road to recovery compared with 39% who believe the country has not done enough to reform its economy. Clearly they remain very unconvinced by the efforts of the Greeks. 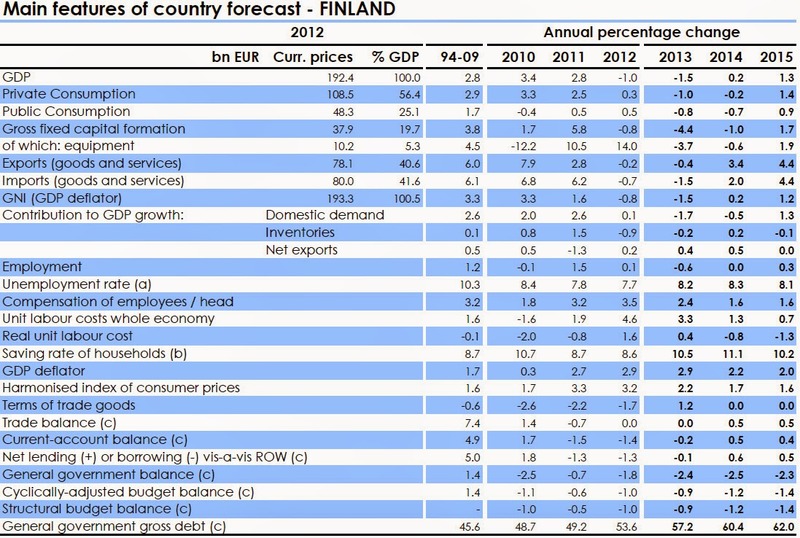 In the same vein, Eurostat this morning put out its first estimate of the debt and deficit figures for the end of 2013. As might be expected they don’t make particularly pretty reading. 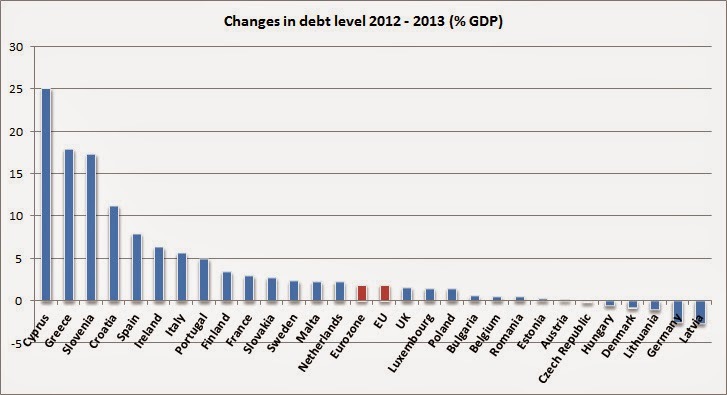 As the graph below highlights, the debt levels in many EU countries have continued to increase and by substantial amounts in Cyprus, Greece and Slovenia – all due to bank bailouts/recapitalisations. With debt levels continuing to rise and the long term structure of the eurozone still developing it remains premature to cast the crisis as over - at least the Germans seem to think so. An interesting story has been developing over the past couple of weeks and has been flying under the radar somewhat, though Alex Barker over at the FT has covered this story very well, here, here and here. The issue is that the Bank of England has found wording in the details of the EU’s Bank Recovery and Resolution Directive (the bank bail-in plans) which could prohibit governments from protecting central banks against losses when they provide emergency lending to banks in a crisis. Quite a surprising find given that the final text has just been passed (the error was found with only weeks to spare). This is the Emergency Liquidity Assistance (ELA), which we have covered here and here. As a recap, this is the lending which a central bank takes on in a crisis and offers to banks at less favourable rates if they have no other choice to avoid a liquidity crisis. 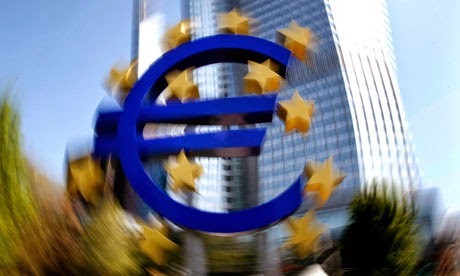 As might be expected it was used heavily by the UK and many eurozone countries during the crisis. Essentially, the concern is that it could expose the BoE to greater risk since it will not have the backing of the UK treasury when extending liquidity assistance, which is risky and can be very large when a financial sector the size of the UK’s is in crisis. The BoE located the problem and alerted the European Parliament (EP) and other member states, while requesting to reopen the text of the legislation to amend the wording. The EP accepted and even published a revised text to take account of the concerns - see article 27 (2). In the end, however, the move was formally vetoed by the Netherlands, Finland and the Czech Republic due to concerns that reopening the text would lead to a raft of other demands, notably by France, Italy, Sweden and Portugal who were seeking further assurances that they could issue guarantees for bank bonds without requiring bank bail-ins first. This may potentially be a very big deal - but there could also be ways around it. Ultimately, ELA can still be extended it just cannot have a blanket guarantee from the government. The central bank balance sheet should be strong enough to deal with this, although if losses were taken it could become an issue – would bail-ins be required, say, before the central bank was recapitalised? Furthermore, this doesn't just impact the UK, ELA was heavily used in the eurozone and is arguably more important for the eurozone than the UK since the ECB still struggles to act as a real lender of last resort. That the deal isn't now re-opened despite an obvious flaw in the legislation is symptomatic of EU law - the constant fear of reopening deals or reassessing them due to uncertainty over what countries might begin to demand. This too often used as an argument against reform, when in fact it should be one in favour of reform. It highlights the need for a broader overhaul of the legislative approach and the need for a clearer structure and mechanism to reassess legislation. All too often this fear paralyses the process of improving or changing the EU. That said, looking at the revised EP text, there do seem to be a huge amount of changes (the text in bold and italics). This seems to highlight some severe concerns with the original agreement and again brings home concerns over the level of uncertainty - what is a precautionary recapitalisation? - that continues to dog the agreement. The alliances that built up on this issue are also interesting and somewhat unusual. The UK had the support of the European Parliament and even France and Italy, although they seemingly wanted to reopen the text for other reasons. 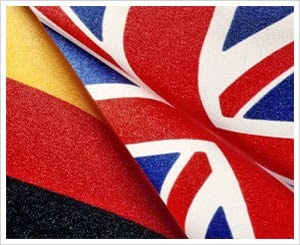 However, Netherlands and the Czech Republic were firmly against, while Germany was very hesitant. The UK should take comfort in this. On this particular issue, the divide wasn't eurozone versus non-eurozone - that potential divide remains one of the biggest liabilities in the UK-EU relations, particularly in financial services. Most importantly though, how in the world did finance ministries and central banks - including the Treasury and BoE effectively - miss a provision which governs fundamental central bank actions? Admittedly, we didn't spot it either and it is a very technical clause but these are exactly the types of things that central banks should be on the look out for. It certainly raises some serious questions about the level of oversight and analysis of EU legislation both at the EU and national level. How did everyone miss this the first time around? If the central banks weren’t involved earlier, should they be on important financial legislation such as this? Credit to the Bank of England for at least detecting it. Better late than never (well, sort of, in this case). 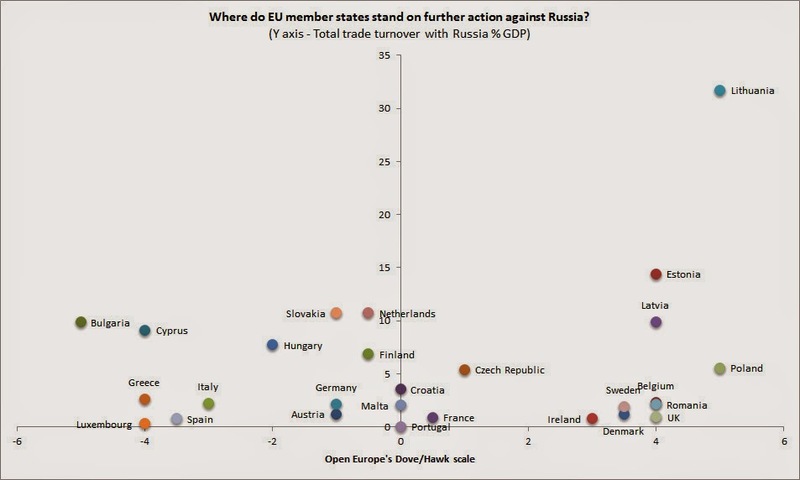 In a new flash analysis out today, we look at where each EU member state stands on expanding sanctions against Russia. There is a huge diversity of views within the EU on what to do next with regards to Ukraine and Russia. This is mostly down to divergent interests (economic, political and cultural) for different member states, as well as varying views on the effectiveness and implications of further sanctions. Countries range from Poland and the Baltics, which have very strong economic links with Russia but remain very hawkish, likely due to historical experience, to countries such as Bulgaria and some Mediterranean countries which remain quite dovish. Open Europe has attempted to quantify this on a Dove/Hawk scale from -5 to +5. The average ranking for EU members is 0.4 suggesting that the bloc as a whole remains someway off from finding the unanimity needed to push further sanctions. In terms of trade links to Russia, Lithuania has the largest trade turnover at almost 32% of its GDP, while the Netherlands, Slovakia and Estonia also have high levels at 11%, 11% and 14% of GDP respectively. There is however, no strong link between deeper trading links and a more dovish approach to sanctions on Russia, suggesting the discussions are informed by a number of complex factors. The key graph is below (click to enlarge). Clearly there is a huge level of divergence, based off a number of factors (not just total trade turnover, which is shown on the vertical axis). Despite all this, further sanctions remain on the table. In the analysis we examine what form further sanctions could take. It would likely be sanctions on: specific firms, sectors or broader financial sanctions. The fallout of all of these has the potential to be serious, possibly explaining some of the divergence across the EU. Attention now turns to tomorrow’s meeting between the West and Russia. The focus remains on a ‘diplomatic solution’ but with Russia warning of civil war (not least because it fits its narrative of instability), and calling for the UN to condemn Ukraine’s actions to remove pro-Russian forces in Eastern Ukraine, this remains very uncertain. The Times today uses the news that Nigel Farage is to be investigated by the EU’s anti-fraud office OLAF, following a complaint from an ex-Ukip official that £60,000 of EU allowances paid into his personal bank account have gone “missing”, to attack the “fraudulent prospectus” that he is “the politician who is not a politician”. 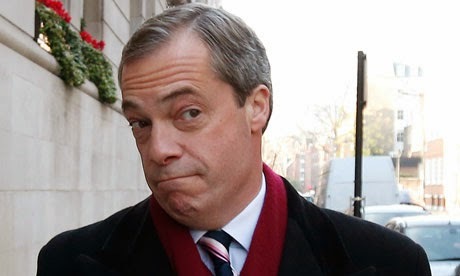 "The Ukip leader has received £15,500 a year from the EU since at least 2009 to pay for the upkeep of his constituency office, a small converted grain store near Bognor Regis, according to transparency reports filed on the party’s website. However, the grain store was given rent-free to Mr Farage by Ukip supporters 15 years ago. Utilities and other non-rental costs amount to no more than £3,000 a year, according to the former office manager, leaving about £12,000 a year unexplained." We looked at this additional pension scheme back in 2009, when it closed to new members, and it was controversial for two reasons. Firstly, it was two-thirds funded by taxpayers and, second, the system relied on MEPs being honest enough to fund the shortfall in their allowances out of their own salary. Credit to Farage for leaving the scheme - but being part of it in the first place doesn't reflect well on him (though he's one of many, many MEPs from all parties who were or still are). Whatever the rights or wrongs of Farage's actions, this illustrates that the EP's allowances and expenses system is still miles away from what taxpayers should accept. The General Expenditure Allowance is notoriously vulnerable to abuse because it is generous, has a wide list of potential uses and does not require MEPs to produce receipts. The Times' leader itself admits that "It is probable, even if these allegations prove to be true, that Mr Farage has done nothing illegal". "We have used the money to promote the cause of Britain leaving the European Union and we have done that unashamedly"
It is right that Nigel Farage is subject to proper scrutiny and that investigations are carried out if he has a case to answer, but there's still no proof he has done anything illegal. And whether singling out Farage will actually help or hurt his cause remains to be seen. However, what's clear is that the EP's allowance system must urgently be reformed. The EP allowances system is something that we'll most definitely return to. Former Italian Prime Minister Mario Monti may be out of Italian politics, but it's fair to say he still likes to talk - especially when travelling abroad. In an interview with Belgian daily De Morgen and Dutch daily De Volkskrant, Monti seems to hint at what many Bundesbank-fearing Germans already suspected: that the ECB's pledge to do "whatever it takes" (i.e. the OMT, the new bond-buying scheme) was de facto grounded in a political decision - contrary to what the ECB's mandate dictates. [At the June 2012 European Council], I have used my full negotiating position in order to get a line approved that looks boring at first glance. At 4 am, the signatures of all leaders had been provided, including the ones of [German Chancellor Angela] Merkel, of my good friend the Dutch Prime Minister Mark Rutte, and of Finnish Prime Minister Jyrki Katainen, you can say the monetary firepower from the North [...] The line established, in short, that eurozone countries who did their homework, like Italy, were guaranteed ECB support. That statement – at the highest political level – didn’t impress the markets, because the leaders did have the authority, but no money. One month later, ECB President Mario Draghi came out with his famous statement: the ECB is ready to do whatever it takes to preserve the euro. And believe me, it will be enough. 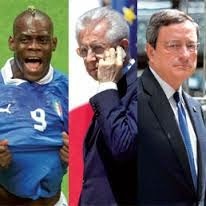 That did calm the markets, because Draghi did have the money. Monti is clearly trying to claim some credit - and the headline of the interview in De Volkskrant is actually "Mario Monti: the man who saved Europe". However, if Monti is right, it clearly means that the ECB's political independence was seriously compromised, since, strictly speaking, there should be no link whatsoever between a political agreement and ECB action..
Draghi's statement is one of the main reasons behind the fall in borrowing costs for countries in the eurozone periphery - some of which have yet to deliver on real economic reform. Monti may have given Draghi some of the credit - but he has also given fuel to those Germans who fear the ECB's independence is a thing of the past. 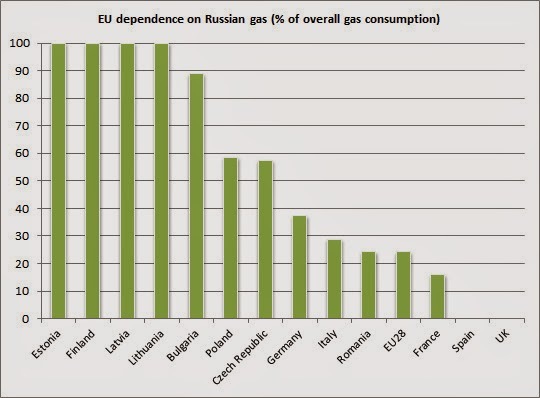 The EU stands united in the face of Russia - or does it? 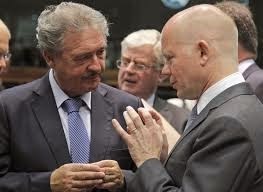 Arriving in Luxembourg this morning to discuss events in Ukraine with his European counterparts, British Foreign Secretary William Hague called for a "clear and united" EU response to Russia's 'escalation' of the crisis. There is very little doubt -- there can't really be any real doubt -- that this [the unrest in Eastern Ukraine] is something that has been planned and brought about by Russia. The forces involved are well armed; well trained; well equipped; well coordinated and behaving in exactly the same way as what turned out to be Rusian forces behaved in Crimea, before the full Russian military takeover of Crimea. I don't think denials of Russian involvement have a shred of credibility. I cannot actually imagine -- just how the EU could not identify with the men dressed in black in the Maidan -- I cannot imagine that the Russian side identifies with the men in black, with guns and weapons, that are occupying administrative buildings and government buildings in Eastern Ukraine. I am still convinced after I heard President Putin, and the Russian Foreign Minister, that the Russians do not want to destabilise East Ukraine and do not want to occupy Eastern Ukraine. If it looks like a horse, and it acts like a horse, then it is probably a horse -- not a zebra. Why is the UK so bad at counting people who come and go? The ONS has now admitted that its figures for net migration into the UK were underestimated for the best part of a decade. For the period 2001-2012 it has said that 346,000 more people came to the UK than under its previous count. That the migration figures are liable to revision should be no surprise as the underlying original data - the International Passenger Survey (IPS) - is (as the name suggests) only a survey. The UK Government doesn't properly count who comes and leaves. However, the underestimation is still startling. Of the newly found 346,000 (the green line charted below) it is assumed that most of it can be accounted for by EU migration. 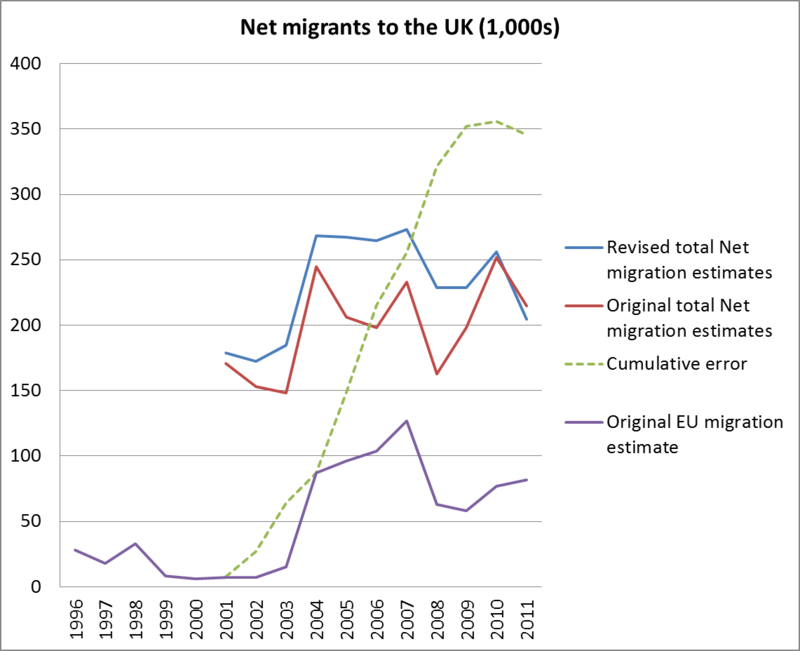 As we can see from the purple line net EU migration picked up after 2003 peaking in 2007 at over 100,000 per year. 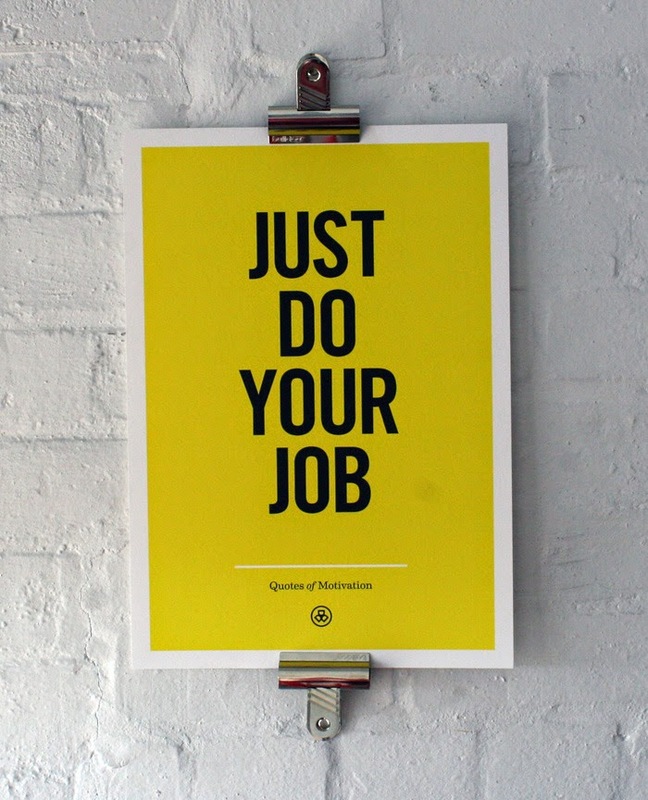 This coincides with the period of the majority of the ONS under-counting. The ONS believes its under-counting was due to a failure to recognise the large numbers of EU migrants coming through regional airports. Under the original IPS figures for the 1996-2011 period, a net figure of 3.9 million came into the UK of which 800,000 were from the EU. So who are the newly discovered 346,000 and how many EU migrants did actually come to the UK? The answer is that we do not know. 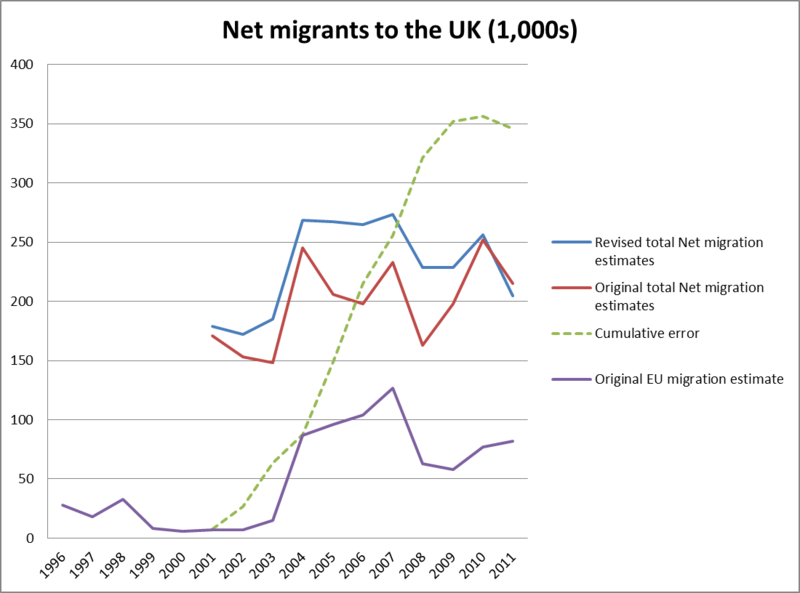 The 2011 census, which is a more accurate dataset, suggested that there were 2.7 million EU migrants in the UK of which 1.1 million had come from the 'new' post 2004 accession states. But this may itself be an underestimate and will include a large number of longer term migrants. It is likely that the ONS is right to suspect that their figures for EU migrants were underestimated but unless the UK starts counting people in and out we will never accurately know. This is one of the biggest problems with the EU migration debate: the absence of reliable data and information erodes public trust in free movement. Yes, EU membership involves some loss of control over the border. But the UK is still out of the Schengen 'passport free' zone and other countries - via more effective identification (a complicated discussion in itself), taxation and border systems - are far better than the UK at counting. It has been labelled by some as the “amazing comeback”. Greece has this morning sold €3 billion of five-year bonds at an interest rate of 4.95% - and the demand exceeded €20 billion. But this outcome has left a few people scratching their heads and wondering what this means for Greece and the eurozone – both of which continue to struggle when judged on a broader set of data indicators. Below, we try to address some of these questions in a reader-friendly Q&A. Why has demand been so strong? There are a couple of reasons for this, and they have little to do with Greece. The bond auction remains small, and the yield fairly decent relative to other peripheral economies and 'junk' or high yield bonds of similar length. And there will always be investors looking for a better return. After all, even in the immediate aftermath of the Greek debt restructuring there were plenty of investors willing to take a punt on the newly formed bonds in the secondary market – and many of them ended up with good returns. This links to a broader problem in Europe, and even in developed economies – the shortage of safe assets and the lack of yield. Given the rock-bottom interest rates and dwindling inflation, the level of return available on many financial instruments is not what it used to be, and investors are keen to find new avenues to boost their gains. But isn’t there a huge amount of risk involved? Actually, given the structure of the deal and the environment involved, maybe not as much as one would expect (click on the graph to enlarge). Firstly, the bonds will be issued under English law. This will stop them being restructured in a similar fashion to the previous Greek bonds, meaning that the investors have significantly stronger legal protection. Secondly, the maturity of the debt is quite short, especially relative to the very long term (20+ years) maturity on the loans from the eurozone. This ensures that payment of these bonds falls well before Greece needs to start paying off its official loans – as the graph above highlights. Thirdly, the ECB’s promise to purchase government bonds if the crisis escalates again still stands. Furthermore, this has been combined with greater support from the eurozone for Greece and a new aversion to write downs of sovereign debt. All of this means the likelihood of losses on Greek private sector debt has been significantly reduced. It has not been eliminated, but if any write-down were to be forthcoming it would most likely be losses on official sector loans, not least because they now make up 66% of Greek debt. This has almost come out of nowhere in the past week or two: why such a rush? The first, obvious reason is Greece’s need for further funding. The issue of a funding gap this year and over the coming years (estimated to be around €20bn up to 2016) has been well covered. This bond issue, combined with some new fiscal measures and probably the leftover capital in the Greek bank bailout fund, will help fill most of that fiscal gap over the next couple of years. It also potentially paves the way for further debt issues. However, there are deeper political reasons. As shown by yesterday’s anti-austerity strikes, this morning's bombing outside the Bank of Greece and the dwindling majority of the government in parliament (which now stands at only two seats), there still is a significant amount of political uncertainty around. The government seems to harbour hopes that this return to the markets will galvanise its support, and act as a symbol of the turnaround it has helped to create. Furthermore, with the European elections around the corner and the opposition SYRIZA party looking set to do well, the government seems to believe that this issue could somewhat also boost their support at the polls. But how much of a turnaround does this really signify for Greece? While it’s certainly a positive, the macro level data for Greece remains worrying. As the charts below show (courtesy of Natixis), unemployment remains very high. In particular, youth and long-term unemployment are both stubbornly high, and threaten to become a drag on the economy in the longer term. While business activity has stopped its decline, the hope of a swift recovery is yet to be based on clear evidence. There is a long way to go in the structural reform programme, as highlighted by the 329 reforms recommended by the OECD. More broadly, Greece’s long term strategy for competing and growing in the eurozone remains unclear, and it has zero room to absorb further economic shocks. 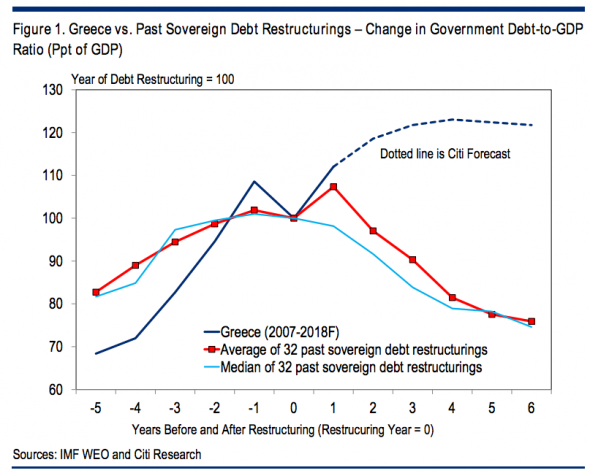 Citi - forever bearish on Greece - took it upon themselves to be the buzzkill amongst all this optimisim with the chart below (via FT Alphaville). Ultimately, it remains a small symbolic step, especially given the size of the bond issue. Will Greece get to spend this money as it wishes? That seems hopeful at best. While Greece may have a little more flexibility compared to when the funding comes from official loans, of which almost every penny is clearly assigned, there will be little wiggle room. As even those countries outside bailout programmes have found, the oversight at the eurozone level is now quite significant. Greece’s budget still has to be agreed in tandem with the EU/IMF/ECB Troika, and little flexibility is likely to be allowed, especially since there is already an outstanding funding gap which needs to be filled. "Hollande simply rubs the Germans up the wrong way. His spending rhetoric is an outright challenge to German Chancellor Angela Merkel’s vision of a euro firmly grounded in Prussian budget discipline." "Therefore, though it won’t be easy, the scope for a new bargain between London and Berlin – based on Britain needing new terms of EU engagement if it is to remain inside, and Germany needing the UK’s quiet support for a more economically sustainable euro – is possibly greater than ever." While Hollande's push against austerity has waned, the process of Anglo-German cooperation has gained pace - exemplified by the recent joint op-ed in the FT where George Osborne and Wolfgang Schäuble agreed on the need for safeguards for the single market in the face of tighter political and economic integration in the eurozone. Kaiser's call for greater economic openness within the EU also echoes the argument in favour of greater services liberalisation by Die Zeit's London correspondent John F. Jungclausen, who cited Open Europe's report which found that removing barriers to cross-border services trade could alone produce a permanent increase to EU-wide GDP of up to 2.3% or €294bn. It's good to see the process beginning to bear fruit and gain wider traction in the German media, particularly on the specific areas where reform is necessary. As we pointed out ahead of Chancellor Merkel's recent visit to the UK, there is scope for a wide ranging 'Anglo-German bargain' in areas such as EU migrants' access to benefits, greater powers for national parliaments, and the devolution of some EU back to the national or local level. According to a recent Open Europe/YouGov poll, an EU reform agenda built on these pillars would enjoy significant public support in both countries. With all this in mind, now would seem the perfect time for the UK government to begin road-testing specific reforms in Germany and other countries. The European Court of Justice (ECJ) has this morning struck down the EU's Data Retention Directive by declaring it "invalid". The ECJ had been asked by the Irish High Court and the Austrian Constitutional Court to rule on whether the Directive complied with the EU's Charter of Fundamental Rights. In one sentence, the Data Retention Directive requests telecommunication services providers and operators to store certain categories of information (date and length of phone calls, senders and recipients of e-mails, etc. ), but not the content of conversations, for a minimum of six months to a maximum of two years. It was introduced in 2006 to help national authorities fight serious crime and terrorism. Interestingly, the UK has 'gold-plated' the Directive by fixing the data retention period to twelve months. But other EU member states were less zealous. Last year, Sweden was issued with a €3 million fine from the ECJ itself for failing to transpose the Directive into national law in time. Germany has been taken to court by the European Commission for the same reason. The retention of data required by the directive is not such as to adversely affect the essence of the fundamental rights to respect for private life and to the protection of personal data [...] However, the Court is of the opinion that, by adopting the Data Retention Directive, the EU legislature has exceeded the limits imposed by compliance with the principle of proportionality. The Directive covers, in a generalised manner, all individuals, all means of electronic communication and all traffic data without any differentiation, limitation or exception being made in the light of the objective of fighting against serious crime. Therefore, the real problem for the ECJ seems to be the violation of the proportionality principle. Or, put differently: the rationale behind the Directive is correct, but its scope is disproportionate. Now, we would argue, this is a problem affecting many other pieces of EU legislation (think, for instance, EU employment and health and safety rules) - which is what could make today's ruling an important precedent. than the UK's 'right to reside test'? The Barroso Commission's term is rapidly coming to an end and Viviane Reding and Laszlo Andor are neck and neck in a pulsating contest for who will claim the wooden spoon - the award for worst Commissioner. Reding held the lead for a long time but Andor may have just caught up after his comments about immigration at an event yesterday on engaging the youth in EU politics. Leaving aside the extent of so-called benefits tourism - which we can debate - is a Commissioner from Hungary really saying that anti-immigration sentiment isn't a problem? A bit rich given that an outright fascist party - Jobbik - won almost 21% of the vote in last weekend's Hungarian parliamentary elections, a higher vote share for a similar party than in other EU country, and an increase from around 16% in 2010. Remember, this is a party that even Marine Le Pen from Front National has refused to cooperate with as she considers them to be too nasty. 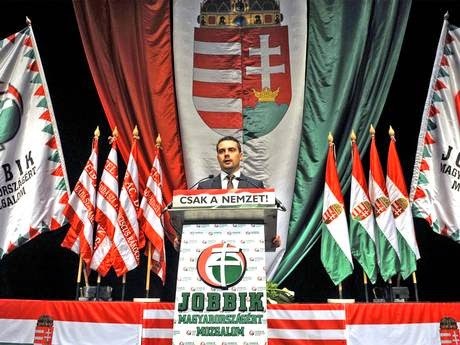 There are plenty of unpleasant parties around Europe but aside from Greece's Golden Dawn, Jobbik really are in a league of their own. Despite running a more restrained and professional campaign, the party is at its core fundamentally anti-Semitic and anti-Roma, espousing a Hungarian nationalism that sees the inter-war dictatorship under Miklós Horthy when the country was aligned with Hitler and Mussolini as a source of pride. The party also has strong links with fascist paramilitary groups that have been involved with violent street clashes with Roma. "The coexistence and cohesion of Magyar and Gypsy is one of the severest problems facing Hungarian society... a segment of the Gypsy community strive for neither integration, nor employment, nor education; and wish only that society maintain them through the unconditional provision of state benefits... certain specific criminological phenomena are predominantly and overwhelmingly associated with this minority, and that as a result such phenomena require the application of fitting and appropriate remedies." Given their general outlook we imagine Jobbik wouldn't be too keen on large scale EU migrations into Hungary (other than of ethnic Hungarians from bordering countries which they have actively called for). It is frankly ludicrous for Andor to single out the UK and other member states struggling to address the political and economic ramifications of unanticipated large scale immigration for criticism when a full blown fascist revival appears to be underway in his own backyard. There has been a cacophony of comments from ECB members and ECB watchers over the past few days. 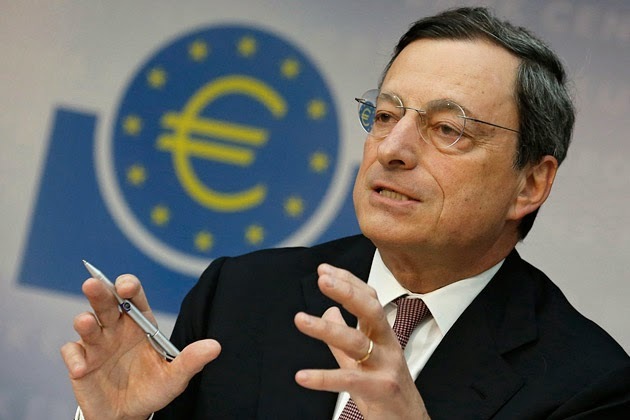 However, the overriding view since ECB President Mario Draghi’s press conference last week is that the ECB has now moved a step closer to unconventional action such as Quantitative Easing (QE). Second, the FAZ report over the weekend that the ECB has been modelling the impact of a €1 trillion per year (€80bn per month) QE programme. While it suggested that such a programme would only raise inflation by between 0.2% and 0.8% (not a significant amount given the cost), the simple fact it is being modelled has been enough to give markets hope. We believe QE or similar measures have become a bit more likely, but mostly because the market now seems to expect action and if the ECB is to maintain its credibility it will need to do more than simply talk. That said, while there may be ‘unanimous commitment’ to using such measures when needed, it’s still not clear what the criteria are for such action and it is even less clear that all members of the GC agree on when such action would be needed. Draghi was pushed on this on the first question during the Q&A session, however, he never provided a direct answer. Furthermore, much of the coverage has suggested that QE is in fact closer because the ideological opposition to such a measure at the Governing Council (GC) level has crumbled - although we're not sure that such a clear unified opposition ever really existed. We have detailed the issues extensively here (but also here and here). Draghi has hinted of these practical issues before, highlighting that they need time to design the programme and gather more information. Beyond political opposition in Germany and the legal limits to ECB financing governments, there is a clear problem in that the purchases would need to split according to the ECB capital key, meaning little would flow to the periphery where the deflationary forces are strongest. Add onto this the fact that QE in other countries has not been proven to boost the real economy or even bank lending as well as that it may exacerbate the squeeze on safe assets and it becomes clear that practically and technically this would be a very difficult step for the ECB to take and is not well suited to tackling the problem of low inflation. See our detailed analysis here. The thrust would be to target purchases of assets which would help promote bank lending – the main one discussed is Asset Backed Securities (ABS), particularly ones made up of loans to the real economy. However, these markets in Europe are small and underdeveloped meaning the level of assets available and suitable for purchase would be minimal. The ECB has suggested it wants this market to grow but it’s tough to force such a move, especially in the short term. We analysed this option here. Since then the ECB seems to have made progress on the technical implementation of such a move. That said, the impact remains very uncertain. It could further reduce excess liquidity, force money market funds to shutter and force banks to pass costs onto consumers. On the plus side it could help weaken the euro. Discussed, with other measures, here. A fairly simply option to take, however, given that there is already full allotment (unlimited liquidity at low rates) and banks have already repaid a lot of the previous LTROs there is no guarantee there would be any significant take up or that it would filter through to the full economy. A smaller measure, discussed in this post. While it would stop liquidity being drawn out of the system on a weekly basis, it’s not clear that this liquidity would flow to the real economy. We rounded up such options a while ago here. Given that rates are already so low and that the transmission mechanism remains broken, the impact of such moves is likely to be limited to signalling intent rather than hoping for any significant return. Overall, nearly all of these measures face quite serious practical, technical and/or legal obstacles. Furthermore, it is unlikely that there is any consensus at the ECB GC level of when each measure is needed or what the triggers for such action are. The obstacles are also probably viewed to be different sizes by each national central bank. All that is to say, while it may have moved slightly closer, don't yet count on QE being much more than a last resort. One of the constant frustrations at Open Europe is that the EU debate is too often artificially framed between two camps: "in at any cost" and "out at any price." That media likes a good shouting match is nothing new, but the biggest victim from framing the debate in such a way is substance. UK media and politics are inherently adversarial, following the logic of two politicians debating over the despatch box. It has its charm and benefits, but when translated to European politics it doesn't quite work, primarily because there are many positions on Europe, with the majority position still being staying in a heavily reformed Europe. As we noted before, for their part, European media are often far too keen to simply copy the artificial two-camp narrative, leading to a conversation of the deaf. This may now be changing slowly. Earlier this year, Open Europe and the Fresh Start group of MPs brought together 400 of Europe's leading reformers at our EU Reform Conference to discuss the next steps. After all, saying reform is necessary without the policy to back it up is all talk and no trousers. There are not only shrill tones in the cacophony of the British Europe debate. In the lower frequencies, there are contributions which Europe should urgently listen to. They come from a group of parliamentarians from both Houses [of Parliament] and different parties that joined efforts because they want to engage constructively. Together with the think tank Open Europe, they develop concrete reform proposals which are just as pragmatic as they are meaningful. Jungclaussen cites Open Europe’s report showing that further liberalising the EU’s services markets would produce a permanent increase to EU-wide GDP of up to 2.3% or €294bn, as a "particularly good example" of one such proposal. Jungclaussen's piece shows that this more nuanced understanding of the debate carries traction, not only in the UK, but across Europe. Last week, the European Parliament had the opportunity of doing what most other elected bodies in the free world consider a core task: making sure taxpayers' money is spent in a transparent, accountable and regular way. MEPs were asked to provide discharge to the 2012 EU budget, in which according to the European Court of Auditors, the rate of error rate had increased to 4.8% compared with 3.9% in 2011 and affected every area of EU spending. The COA's own benchmark for acceptable levels of error is 2%. Of the total €138.6bn spent by the EU in 2012, €6.7bn was affected by errors. However, MEPs voted to approve the discharge report, drafted by German CDU MEP Markus Pieper, with 488 votes in favour, 121 against and 10 abstentions - effectively signing off the budget. "For the 19th time in succession, the Court of Auditors was unable to grant a positive statement of assurance regarding the legality and regularity of the payments underlying the accounts". "a distinction must be drawn between errors and fraud, and [the EP] considers that, in the vast majority of cases, errors stem from administrative mistakes, many of which are linked to the complexity of Union and national rules, which can be corrected". They have a point. Errors and fraud are not the same thing - though the line can be awfully blurred. However, we doubt the average taxpayer would be entirely content with that explanation. The bottom line is that the cash should not have been paid out. As we've argued before, the high level of error is primarily due to the nature of the EU budget itself - it's size, complexity, confused objectives etc - and this will persist until it's fundamentally reformed. What's interesting about the MEPs' behaviour is that they are a lot less forgiving when it comes to the spending by European Council/Council of Ministers - i.e. the member states.The EP decided to postpone the approval of the Council's accounts "because of its lack of cooperation". EU Anti-Fraud Commissioner Algirdas Šemeta reacted to the EP's decision by saying that "The EU budget is the one of the most transparent and accounted for public budgets in the world", while arguing that "For the past 5 years, the overall error rate has been consistently below 5%. In other words, over 95% of all EU spending is in line with the rules." "the overall error rate in recent years has increased to 4.8 %, being significantly above the acceptable threshold of 2 %." Surprisingly, Labour and Lib Dem MEP, but also Dutch VVD MEP Hans Van Baalen voted against the position taken by their member states in the Council. 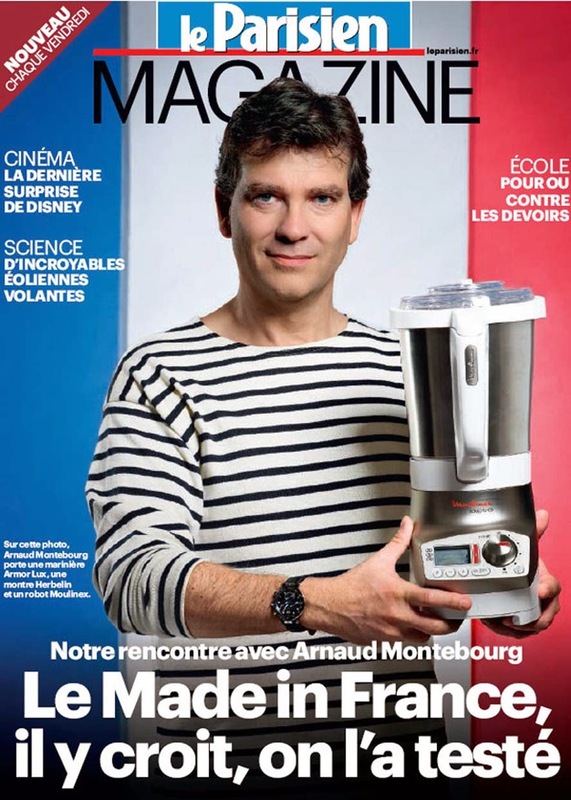 The appointment of Arnaud Montebourg - an outspoken critic of German and EU-mandated austerity and pro-competitivenesses policies - as the new French Economy Minister has not gone down well in Germany. "He sees himself as the legitimate successor of Jean-Baptiste Colbert, the finance minister of the legendary French Sun King Louis XIV... In his previous post of Minister for Re-industrialisation, he above all others terrified foreign investors with class warfare slogans, and now has acquired even more powers in the government of President Francois Hollande". “The EU is the only one that does not protect itself against unfair competition. We have become the idiots of the global village...For 30 years, consumers have made the law in Europe and the result has been a disaster. Me, I defend the producers." "[These people] exercise law in the manner of the taliban, [they are] fundamentalists who apply the [legislative] texts blindly to the detriment of European interests". "The issue of German nationalism is resurfacing through the policy à la Bismarck [of Angela Merkel]." "Mrs Merkel is killing the euro, and it would be time to show the failure of the German model, rather than singing its praises." Even allowing for the fact that Montebourg is playing to the gallery a fair bit, and that the new government's economic policy will remain more pragmatic overall, it is clear why his appointment will raise concerns in Berlin and beyond about France's already fragile economic situation. In the meantime, we're looking forward to new additions to his already impressive repertoire of memorable quotes.